Annexin V-Cy5 Apoptosis Staining / Detection Kit ab14150 is used in a 10 min, one-step staining procedure to detect apoptosis by staining phosphatidylserine molecules which have translocated to the outside of the cell membrane. Analysis is by flow cytometry or fluorescence microscopy. The Annexin V-Cy5 reagent contained in the kit is also available as Annexin V-Cy5 reagent ab14147. Soon after initiating apoptosis, cells translocate membrane phosphatidylserine molecules from the inner face of the plasma membrane to the cell surface. Phosphatidylserine on the cell surface is detected by staining with a fluorescent conjugate of Annexin V, a protein that has a high affinity for phosphatidylserine. For more apoptosis assays, review the full set of Annexin V assays, or the apoptosis assay and apoptosis marker guide. This protein is an anticoagulant protein that acts as an indirect inhibitor of the thromboplastin-specific complex, which is involved in the blood coagulation cascade. A pair of annexin repeats may form one binding site for calcium and phospholipid. 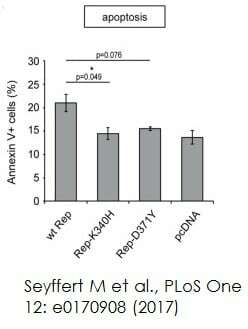 Impact of different Rep constructs on DNA damage response and apoptosis - ab14150Image from Seyffert M et al., PLoS One 12(1), fig 3d. Doi: 10.1371/journal.pone.0170908. Vero cells were co-transfected with different Rep-constructs together with a plasmid expressing eGFP to identify successful transfection. After three days, cells were stained using Annexin V-Cy5 Apoptosis staining/detection kit (ab14150) and analyzed by flow cytometry with filters for eGFP and Cy5. Publishing research using ab14150? Please let us know so that we can cite the reference in this datasheet. Thank you for your enquiry. I can confirm the concentration of annexin V in the ab14150 kit is 30 ug/ml. I hope this will be helpful to you. Should you have any further questions, please do not hesitate to contact us.